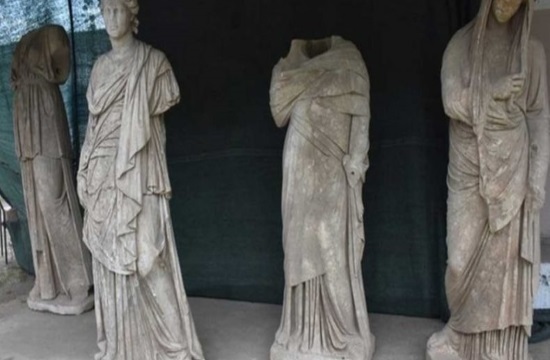 Six statues dating back 2,000 years were discovered Saturday in the ruins of the ancient Greek city of Magnesia, situated in southwestern Aydın province's Germencik district, according to Turkish newspaper Daily Sabah. Professor Orhan Bingöl, who has been overseeing the excavations in the site since 1984, said four female and one male statues were unearthed in the ruins of a temple to Artemis, adding that one of the statues' gender was unknown. Bingöl specified that all statues were found in the same area and were in good condition of preservation, placed face-down next to each other. "We know that, along with the ones being displayed in Istanbul, Izmir and Aydın, there have been nearly 50 statues unearthed from Magnesia ruins. This discovery will not be the end of it and clearly shows we can find more statues in this particular area," he noted. The first excavations in Magnesia were conducted between 1891 and 1893 by a German archaeological team led by Carl Humann. The work lasted 21 months and partially unearthed the theater, the Artemis temple, the agora, the Zeus temple and the prytaneion. Excavations were resumed at the site, after an interval of almost 100 years, in 1984, by Bingöl. Magnesia or Magnesia on the Maeander was an ancient Greek city in Ionia, considerable in size, at an important location commercially and strategically in the triangle of Priene, Ephesus and Tralles. The city was named Magnesia, after the Magnetes from Thessaly who settled the area along with some Cretans. It was later called "on the Meander" to distinguish it from the nearby Lydian city Magnesia ad Sipylum. The territory around Magnesia was extremely fertile, and produced excellent wine, figs, and cucumbers. It was built on the slope of Mount Thorax, on the banks of the small river Lethacus, a tributary of the Maeander river upstream from Ephesus. It was 15 miles from the city of Miletus.The ruins of the city are located west of the modern village Tekin in the Germencik district of Aydın Province, Turkey. Magnesia lay within Ionia, but because it had been settled by Aeolians from Greece, was not accepted into the Ionian League. Magnesia may have been ruled for a time by the Lydians, and was for some time under the control of the Persians, and subject to Cimmerian raids. In later years, Magnesia supported the Romans in the Second Mithridatic War. Magnesia soon attained great power and prosperity, so as to be able to cope even with a challenge from Ephesus. However, the city was taken and destroyed by the Cimmerians, some time between 726 BC and 660 BC. The deserted site was soon reoccupied, and rebuilt by the Milesians or, according to Athenaeus, by the Ephesians. The Persian satraps of Lydia also occasionally resided in the place. In the fifth century BC, the exiled Athenian Themistocles came to Persia to offer his services to Artaxerxes, and was given control of Magnesia to support his family. The name "magnet" may come from lodestones found in Magnesia. In the time of the Romans, Magnesia was added to the kingdom of Pergamon, after Antiochus had been driven eastward beyond Mount Taurus. After this time the town seems to have declined and is rarely mentioned, though it is still noticed by Pliny and Tacitus. Hierocles ranks it among the bishoprics of the province of Asia, and later documents seem to imply that at one time it bore the name of Maeandropolis. The existence of the town in the time of the emperors Aurelius and Gallienus is attested to by coins. Magnesia contained a temple of Dindymene, the mother of the gods; the wife or daughter of Themistocles was said to have been a priestess of that divinity. Strabo later noted the temple no longer existed, the town having been transferred to another place. The change in the site of the town alluded to by Strabo, is not noticed by other contemporary authors, however some suggest that Magnesia was moved from the banks of the Meander to a place at the foot of Mount Thorax three miles from the river. The new town which Strabo saw was remarkable for its temple of Artemis Leucophryene, which in size and the number of its treasures was surpassed by the temple of Ephesus, but in beauty and the harmony of its parts was superior to all the temples in Asia Minor. The temple to Artemis is said by Vitruvius to have been built by the architect Hermogenes, in the Ionic style. Following a theophany of the goddess Artemis in the 3rd century B.C., the temple and the city were recognised as a place of asylia by other Greek states. Little remains of either temple today. The site of Magnesia on the Maeander was once identified with the modern Güzelhisar; since then the ruins of a temple to Artemis were found at Inck-bazar, and the latter is considered a more likely site. The first excavations at the archaeological site were performed during 1891 and 1893 by a German archaeological team conducted by Carl Humann, discoverer of the Pergamon Altar. These lasted 21 months and partially revealed the theatre, the Artemis temple, the agora, the Zeus temple and the prytaneion. Excavations were resumed at the site, after an interval of almost 100 years, in 1984, by Orhan Bingöl of the University of Ankara and the Turkish Ministry of Culture. Findings from the site are now displayed in Istanbul and Aydın, as well as in Berlin and Paris. Copies of the portico (pronaos) of the Zeus temple and of a bay of the Artemis temple can be visited in the Pergamonmuseum in Berlin. Much of the architectural remains of Magnesia were destroyed long ago by local lime burners. The well preserved remains of the Zeus temple have been destroyed by local residents even after Humann's excavation campaign. In July 2018, six Greek statues discovered. Four female, one male and one with unknown gender were unearthed in the ruins of a temple of Artemis.